The Sensor Bar plugs into the Sensor Bar connector on the back of the Wii U™, Wii mini™, or Wii™ console and is then mounted on top of or below your TV. It works in conjunction with the Wii Remote™ for motion detection. 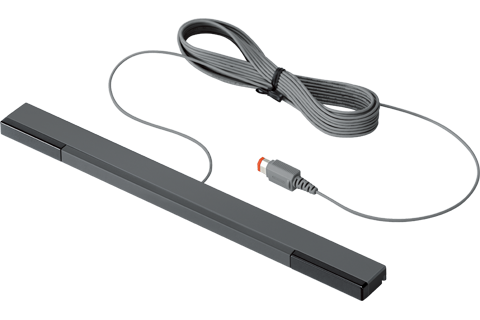 The Wii™ Sensor Bar is now available as Authentic Nintendo Refurbished product only from Nintendo, and it comes with our standard 90 day limited warranty. Although it may have minor cosmetic blemishes, it is guaranteed to be fully functional. We think you will find the standards for Authentic Nintendo Refurbished Products are VERY high. If you are experiencing motion-sensing problems, we recommend following our troubleshooting steps before deciding upon replacement. Communication between the Wii Remote and the Sensor Bar may be improved in some situations by utilizing the Sensor Bar Stand.